In other words, pastures, forests, suburbs, cities, farms, and so on, all affect the skies in very particular spatial ways. Deforestation, for instance, has "substantially altered cloud patterns” in the Amazon; specifically, we read that "patches of trees behave as 'green oceans' while cleared pastures act like 'continents'," generating a new marbling of the local atmosphere. The same thing can be found to happen above cities, of course, with Hyde Park – however minimally – affecting rain fall over central Westminster. One man, realizing this, plants the exact species of tree in the exact location that will lead to diminished rainfall over his own nearby apartment. Possibly sarcastically, mammoth predicts that BLDGBLOG will use this very research to "suggest a city built with the aim of controlling the cloud patterns above" – and I hate to be so predictable, but I think it's a great idea. 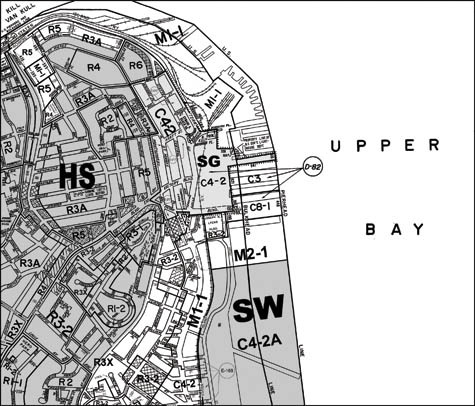 Instead of "being zoned 'R-3 Residential Low Density'," they continue, "a block might be zoned 'Cumulus H-2'." Or Mammatus H-3. All new buildings have to be cleared with a Meteorological Bureau to ensure that they produce the right types of cloud. Atmospheric retrofitting comes to mean attaching bizarre cantilevers, ramps, and platforms to the roofs and walls of existing houses until the clouds look right. Sky vandals are people who deliberately misengineer the weather through inappropriate roof ornamentation. Over generations, you thus sculpt vast, urban-scale volumes of air, guiding seasonal rain events toward certain building types – where, as mammoth's own earlier paper about fog farming suggests, "fog nets" might capture a new water source for the city. 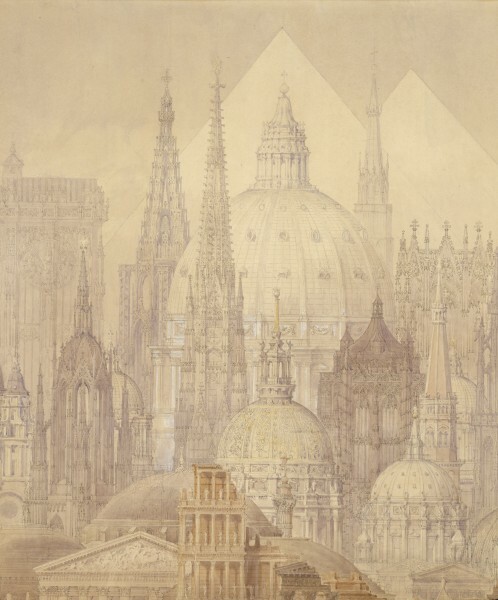 [Image: A Tribute to Sir Christopher Wren (1838) by Charles Robert Cockerell]. 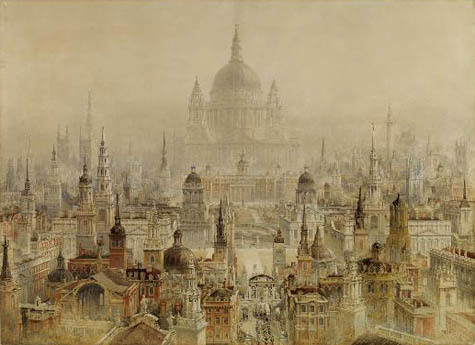 Yesterday in the architecture galleries of the V&A, I found myself looking at a painting by Charles Robert Cockerell called A Tribute to Christopher Wren, from 1838. 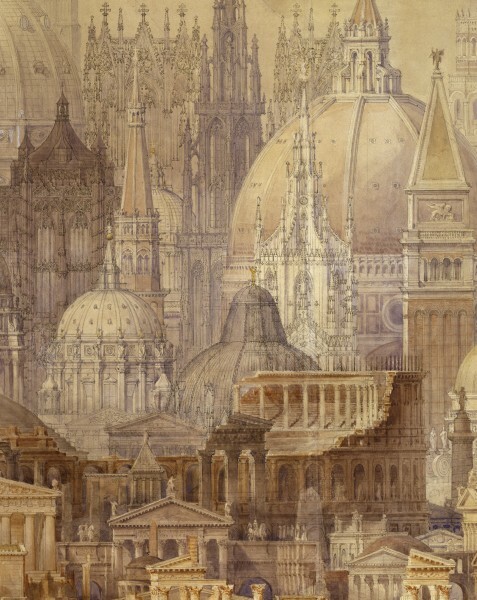 The image is a spatially overwhelming lamination of various buildings all designed by the legendary English architect; in a way, it's an early predecessor of today's total city renderings by firms like Foster & Partners and OMA: a complete metropolis designed in one fell swoop by a master architect. What first came to mind, though, when seeing Cockerell's image, was something that I've mentioned on the blog before – as recently as in the interview with Jim Rossignol – which is that the era of the architectural monograph is over: perhaps we will soon enter the age of the architectural videogame. In other words, what if Charles Robert Cockerell had not been a painter at all, but a senior games designer at Electronic Arts? His "tribute to Christopher Wren" would thus have looked quite different. 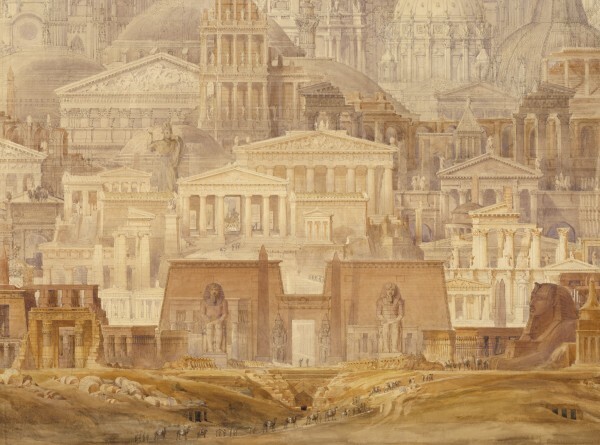 The architect's buildings would still be visually represented, all standing in the same place, but thanks to the effects of immersive digital media and not the intensely beautiful but nonetheless materially obsolete techniques of a different phase of art history. 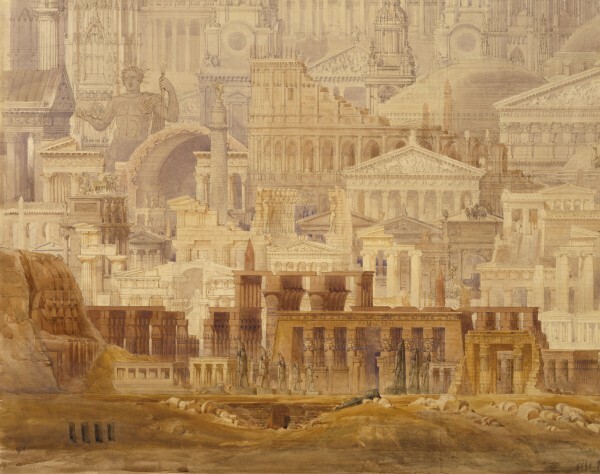 Might we yet see, for instance, A Tribute to Sir John Soane, complete with scenes of zombie warfare beneath the arches of ruined bank halls, released by Joseph Gandy Designs Corporation™? When it comes time to release a major monograph, MVRDV instead releases a videogame. Bjarke Ingels has already released a comic book – the game, as another narrative medium, as simply another option for architectural publishing, can't be far off. Learning about the buildings of Erich Mendelsohn... by hurling virtual grenades at them. [Image: The Professor's Dream (1848) by Charles Robert Cockerell, courtesy of the Royal Academy of Arts]. 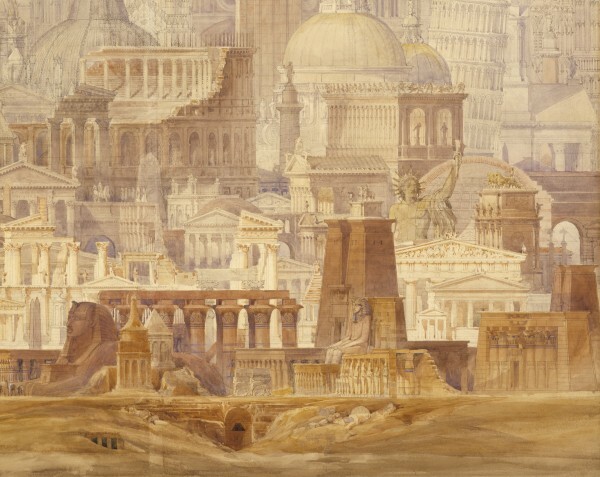 Until then, here are some more or less unrelated close-up views of another of Cockerell's works, the otherworldly pyramids, domes, and steeples from The Professor's Dream (1848), courtesy of the Royal Academy of Arts. 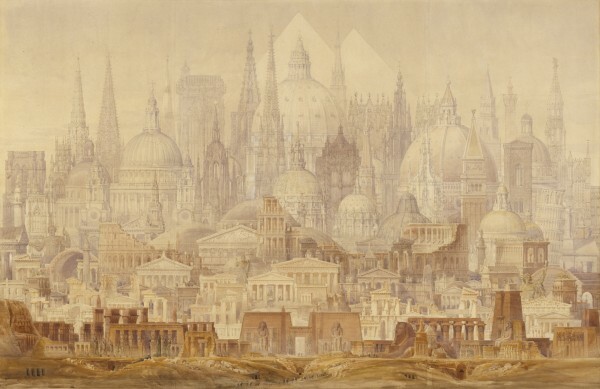 [Images: The Professor's Dream (1848), and several details thereof, by Charles Robert Cockerell, courtesy of the Royal Academy of Arts; say what you like about pastiche, but a part of me wishes that all cities looked like this]. Gaming our way through the future of architectural history. 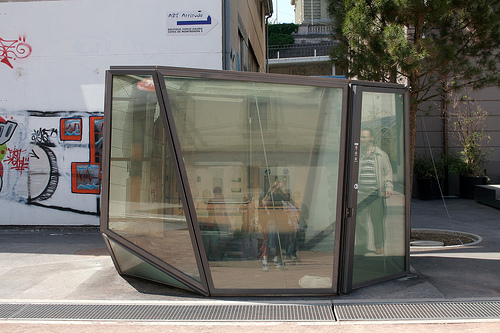 Another item I found curious while spending time in Lausanne the the other day: a see-through toilet. 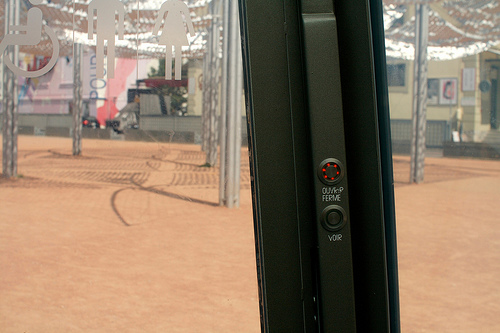 Based on a steel-and-glass architecture, the toilet is based on a transparent system: when pressing the “voir” button (which means “see”), the glass gets transparent and it turns opaque when someone is inside and presses the button again. A motion sensor also turn the glass transparent if there’s no motion during a certain amount of time (to prevent people from staying there for too long or in case of a problem) OR if there is TOO MUCH ACTIVITY (no party is allowed in there). 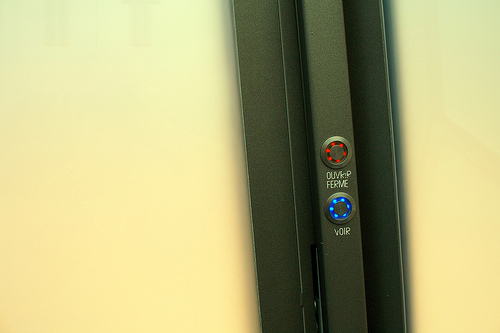 It’s questioning as well to see that the button has been called “VOIR” (”see”), as most of the people who enter the toilet do not want to “see” but instead to “not be seen”. My guess is that it’s on purpose, to disrupt people’s behavior (who would want to press a button anyway to see how to make the glass opaque). An important feature in this design is the presence of a pine tree next to the transparent toilet. This tree has been especially chosen to be planted there because it’s aimed at bringing more pleasant smell. A sort of high-tech/low tech combination. Why do I blog this? An intriguing piece of furniture with curious combinations (the pine tree, the syringe trash can). Is this the Everyware-like city toilet of the future? I don’t know but it’s certainly interesting to understand more the way the glass gets transparent or opaque. The rules embedded in the system, that I described at the beginning of this post, tells us captivating insights about what is considered as normal or not in society. 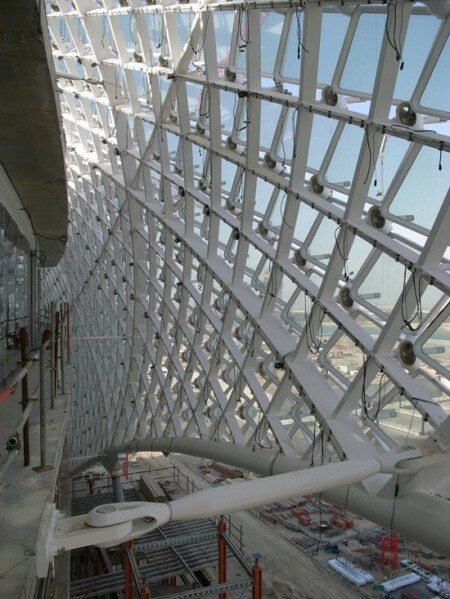 Scheduled to open October 2009, Asymptote Architecture’s YAS hotel in Abu Dhabi is currently nearing completion. 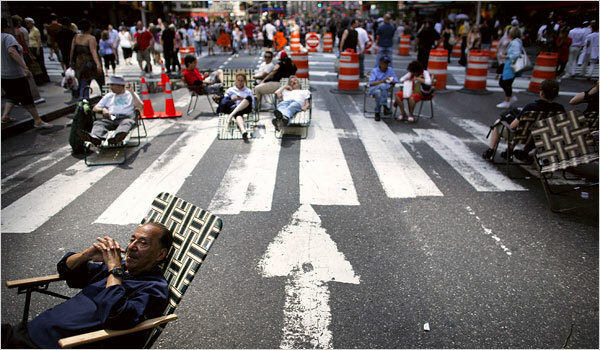 Based in NYC, Asymptote are known for their work at the crossroads of Art and Architecture. Yes, that’s a formula 1 racetrack you can see in front of the hotel in the image below. 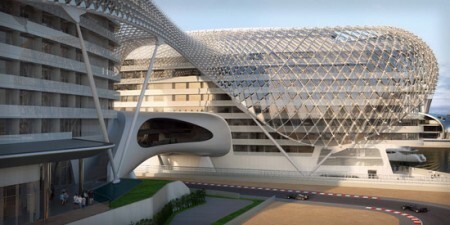 The grid-shell encompassing the hotel complex consists of 5,800 pivoting diamond shaped glass panels. With the help of lighting integrated behind each panel, designed in conjunction with Arup Lighting in NYC, the project is said to ‘respond visually and tectonically to it’s environment. I am yet to figure out for sure whether the individual panels of this facade actually move, but I do remember hearing about a year ago that this was the intention. 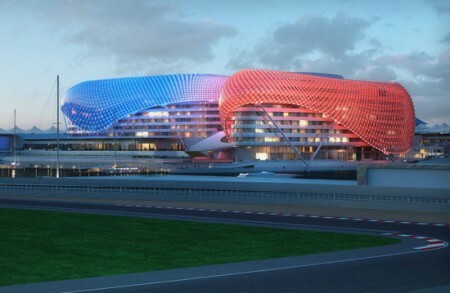 Regardless of whether this ambitious plan made it through to the final design - the result is definitely spectacular. This hotel is, after all, in the desert. In 2004 Hani Rashid and Lise Anne Couture were awarded the Frederick Kiesler Prize for Architecture and the Arts in recognition of contributions to the progress and merging of Arts and Architecture. For this project, I’ll be keen to see what they do with the facade (content?) once it’s up and running.